NBC and ABC in their evening and morning newscasts completely ignored the grilling Eric Holder received on Capitol Hill on Tuesday, over his role in the Fast and Furious scandal. Senate Republicans forced Holder to admit his initial statements to Congress about his department's role in gunwalking were "inaccurate," and that he never apologized to the family of a Border Agent killed by a Mexican drug cartel that used guns from the Fast and Furious operation. Only Sharyl Attkisson, in two full reports aired on Tuesday's Evening News and Wednesday's The Early Show, relayed the testimony that ABC and NBC blacked out on their broadcasts. SCOTT PELLEY: Sharyl Attkisson helped uncover the gunwalking scandal, in which agents of the Federal Bureau of Alcohol, Tobacco and Firearms let thousands of weapons cross the border so they could be traced to Mexican drug lords. Many of those guns were later used in violent crimes. Today, Sharyl tells us that Attorney General Eric Holder was grilled about the program at a Senate hearing. SHARYL ATTKISSON: For the first time Attorney General Holder made the difficult admission to Congress. 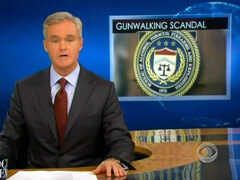 ERIC HOLDER, ATTORNEY GENERAL: Any instance of so-called gunwalking is simply unacceptable. Regrettably this tactic was used as part of Fast and Furious. ATTKISSON: That also means a letter Holder's office sent Congress last February, denying gunwalking, was wrong. HOLDER: What I said is that it contains inaccurate information. SEN. JON CORNYN: Well isn't that false? HOLDER: Well false - I don't want to quibble with you, but false, I think, implies people making a decision to deceive. ATTKISSON: Holder defended his own actions. HOLDER: I took action. I asked the Department's inspector general to investigate this matter. ATTKISSON: But Republicans hammered away, asking about Border Patrol Agent Brian Terry, who was murdered last December by Mexican drug cartel members. Two assault rifles from ATF's gunwalking operation Fast and Furious, were found at the scene. CORNYN: Would you like to apologize today for this, this program that went so wrong, that it took the life of a United States law enforcement agent? HOLDER: I certainly regret what happened to Agent Brian Terry. It is not fair, however, to assume that the mistakes that happened in Fast and Furious directly led to the death of Agent Terry. ATTKISSON: Today Terry's father had a harsh assessment, saying everyone responsible should be prosecuted. KENT TERRY, FATHER OF BRIAN TERRY: And I think they should be prosecuted for not just my son, for all the people they murdered in Mexico. ATTKISSON: Democrats repeatedly raised a separate gunwalking operation, started under President Bush, which we first reported on last March. Attorney General Holder said he didn't know much about that either, but hopes his inspector general gets to the bottom of it all. - Geoffrey Dickens is the Deputy Research Director at the Media Research Center. Click here to follow Geoffrey Dickens on Twitter.